Provide comfort for the family of Keith Kelly with a meaningful gesture of sympathy. Keith passed away peacefully surrounded by his family at Seaforth Community Hospital on Tuesday, March 26, 2019. Born in Tuckersmith Township on February 17, 1934, Basil Keith Kelly of Seaforth was in his 86th year. 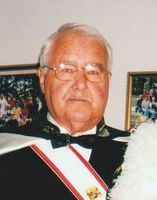 Beloved husband of Rita (née Eckert) Kelly for 64 years. Loving father of Patrick Kelly (Eleanor) of Stratford, Brian Kelly of Stratford, Mary Lou Murray (Stephen) of New Hamburg, Paul Kelly (Janet) of Stratford and Maureen Kelly (Dean Griffiths) of Baden. Cherished Grandpa of Linda Fitzgerald, Joshua Kew (Craig Waterman), Scott Murray (Lindsay Webster), Sam Murray (Julie Baechler), Leanne Kelly, Robert Kelly, Shawn Greulich, Bradley Greulich (Rachelle), and Great-Grandpa of Devvon McKone (Mason Leis), Parker Fitzgerald and Walter Greulich. Dear brother of Jack Kelly (Cecelia) of London, Fergus Kelly (Anne) of Seaforth, Nancy Stapleton (Neil) of Auburn and Mary Jansen (Rudy) of Exeter. Keith will also be missed by his many in-laws, nieces, nephews and friends. Predeceased by his parents Fergus and Esther (née Ryan) Kelly and by his brother Robert Kelly. Keith was a proud member of the Knights of Columbus, Father Stephen Eckert Council No 5289. Visitation will be held at McGlynn Family Funeral Home, 87 Goderich St. W., Seaforth, 519-527-1390, on Thursday, March 28, 2019 from 2-4 and 7-9 p.m. (with a Knights of Columbus Service and Parish Prayers at 1:15 p.m.) Visitation will continue at St. James Catholic Church, 22 Victoria St., Seaforth, on Friday, March 29, 2019 from 10 a.m. until the time of Keith’s Funeral Mass of Christian Burial at 11 a.m. A reception will follow at the Seaforth and District Community Centre, and interment will take place in St. Patrick’s Catholic Cemetery in Dublin, later in the spring. Knights of Columbus Service and Parish Prayers at 1:15 p.m.
Interment will take place later in the spring. Consider providing a gift of comfort for the family of Keith Kelly by sending flowers. We encourage you to share your most beloved memories of Keith here, so that the family and other loved ones can always see it. You can upload cherished photographs, or share your favorite stories, and can even comment on those shared by others.